This is a Google translation of the swedish original, somewhat revised. Structure of matter according to string theory. Top two crystals. They consist of a large number of atoms. An atom is in turn made by a nucleus consisting of protons and neutrons, and around the core spin the electrons. They are energy strands of a particular type. The protons and the neutrons are in their turn composed of quarks, which also consist of energy strings. Picture from Wikipedia. Has the universe a lifeless, throughout mecanistic construktion? Or is the universe something more, for instance a self ruling unity, that developes more and more? This is discussed in this essay at the background that the string theories are no more believed to be the solution of the enigma of the universe as many scientist for a time believed. For a while in the 1990s and 2000s it seemed like string theory or really string theories (it has been brought forward six) in physics was about to expand man's horizon of knowledge in a remarkable way. But in the 2010s came a setback. A physicist, who himself contributed with ideas, that have developed string theory, the Dutch professor of theoretical physics at the University of Utrecht, also the Nobel Laureate in 1999, Gerard 't Hooft (the preposition 't is a weakening of the Dutch definite article het, corresponding to English ”the”), published an article entitled Entangled quantum states in a local deterministic theory (arXiv: 0908.3408). In the paper he said that the most valued of string theories, called superstring theory, ”still appears to exhibit important gaps and it is difficult to interpret at a more fundamental level”. Furthermore, the theory is suffering from the fact that it is difficult to obtain from it ” significant predictions”. It is undeniably a critical shortage for a scientific theory; Einstein's relativity theory had its strength precisely in the predictions. String theories had grown out of the need to reconcile the early 1900's two major theories in physics: Einstein's general theory of relativity and quantum mechanics (now often referred to as quantum physics). The string theoreticians suggest, that the smallest objects in the universe are extremely small, one dimensional energy strings. They form the particles, which in turn builds up the forces and atoms, and in an extension constitutes the universe. Perhaps the most intriguing of these theories or hypotheses is that the string theoreticians have assumed that there are more dimensions than the four we are familiar with (between 8-26 dimensions have been proposed). In the discussions of the entropy of black holes in the 1980s was the great discovery that string theory and information theory in several respects describe the same thing. It led to one of the strangest proposals to date that the world of atoms including humans would be holographic representations of the information inscribed in a two-dimensional surface in the outskirts universe. One of the merits of the string theories is that they put in question our three dimensional reality and therefore René Descartes' philosophy. The French philosopher, who in Latin is also referred to as Cartesius, lived from 1596 to 1650. He is best known for his statement Cogito, ergo sum (I think, therefore I am). But he also thought that the observable physical reality was entirely mechanistic. It was structured like an old-fashioned watch, an analog clock. The English physicist Isaac Newton (1642-1727) envisioned in the same way our reality. Even in the equations of Albert Einstein (1879-1955) the mechanistic thinking haunted, even if he turned it in a relative direction. But while Einstein formulated his revolutionary findings came something even more radical in physics. It was just the emergence of quantum physics. It was founded by the German physicist Max Planck (1858-1947) in 1900 and then developed in the following decades by a considerable number of important theoretical physicists, among them the Dane Niels Bohr (1885-1962). Quantum mechanics describes the behavior of matter and energy in the microcosm (as opposed to macrocosm, the observable physical reality). Quantum physics is about particle world. It is characterized by an uncertainty principle. String theory took a major step forward in the 1980s, when it succeeded in describing all the particles and the ways in which they interacted in coherent mathematical formulas. The next step was the discovery of that the information theory had an entropy concept, that could be used in physics. This theory had in the 1940s been developed by the engineer Claude Shannon (1916-2001) at Bell Laboratories and is the basis for today's computer technology. But physics could also use this theory to explain some peculiarities of black holes. In the next step it was possible to perceive the observable physical reality as a hologram created by information coming from the outskirts of the universe. It can be interpreted as the observable physical reality would be determined from beginning to end. In this essay I want to discuss, among other things, the holographic principle in relation to our view of life. It is possible that I am completely wrong, because I am neither a physicist or quantum physicist but writing philosophy. On the other hand, it has been found that physicists and ultimately cosmologists and string theoreticians are not interested in philosophy. There are physicists who believe that philosophy is unnecessary. But that is a dangerous attitude, because it gives the scientific description the position of (pseudo)religion. That this is the case can be studied in an article in the Swedish newspaper Svenska Dagbladet. It was written by the physicist Michael Smedbäck at Uppsala University. Although the article is a popular scientific presentation, and as such very meritorious, the tone and terminology is a scientifically accurate description of the holographic principle (article available online at: http://www.svd.se/kultur/understrecket/ the-way-to-a-final-theory-for-fysiken_175378.svd). But if we see such a description as the last word, this will lead to a collaps for the philosophy of life. Should we just be holographic puppet dolls, which, controlled by gravitational threads, dances and jumps for a will, that is two-dimensional in the outskirts of the universe? The philosophy was born out of a new juridical thinking around 600 BC in Greece – the new mercantile law protected by the god Apollon. The first philosophers, known as presocratics, were all lawyers. Instead of priests who gladly explained the world in mythological paradoxes, they developed a new method consisting in empirical observations and logical conclusions. With Socrates (469-399 BCE) shifted the interest of philosophy against ethics, life attitudes and philosophies of life, a shift that culminated with Plato's speculations. The sociological importance of this philosophy was that it gave rise to a first school systems outside the temples. During late antiquity it was wiped out step by step by Christianity in the form of the Catholic Church, which was totalitarian at this time. Then during the Middle Ages the philosophy was forced to merge with theology, as the case was in the philosophy of the dominican Aquinas (1225-1274), thus weakening the contact with the empirical data. It brought about that philosophy for a new start had to be founded on something other than law. Thanks to the development of mathematics, first in medieval India and then in the Arab culure, matematics became the trigger. Fourteen-century surveyors could, thanks to the new mathematics, figure out how the channels between the rivers would be built to serve. Mathematics began soon to be used by artillery officers to calculate the flights of cannonballs. The German mathematician and astronomer Johannes Kepler (1571-1630) saw that it could also be used for calculating the orbits of the planets. Descartes, who recently had served as an artillery officer, then came to the actual philosophical reconvergence. The knowledge thus gathered was then used by Isaac Newton (1642-1727) to develop what is now called classical physics. It came in the 1700s to play a crucial role for the Enlightenment and its thinkers, especially in Catholic France. But the development of science in the latter half of 1900 and early 2000 centuries meant that philosophy ended up on the sidelines. Especially the way physics broadened our horizon of knowledge during this time came effectively to surpass philosophy as truth seeker. The Austrian-Brittish philosopher Ludwig Wittgenstein (1889-1951) pronounced in practice the death of philosophy by seeing it only as a form of social game. But German and French philosophers emphasized the life aspect of philosophy. Philosophy of life is of course a part of a social game, but a very central part. We can not live as civilized people without any kind of conception of life. With the mapping of the universe's background radiation were also presented a picture of what the universe looked like. According to NASA and the cosmological research community it has the shape of a horizontal oval, a lot like an American football. How central the view of life in the social game is, is shown by the fact, that the American NASA does not hesitate to manipulate scientific facts. 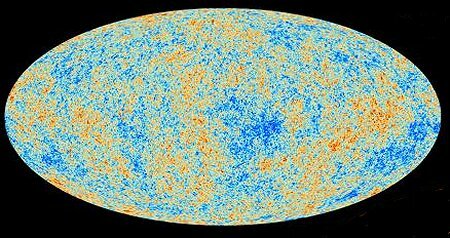 The picture above reproduces a image of the universe, which was sent out by NASA in 2006 after the second survey of background radiation of the universe by the WMAP satellite (= WMAP Wilkinson Microwave Anisotropy Probe). The background radiation is an electromagnetic echo of the Big Bang. According to NASA's image would the universe be oval and almost resemble the oval-shaped football used in American rugby. As this football is well known to the American public, the form will be perceived as safe and controllable. But a very different picture is presented on a statue outside the Physicum building belonging to University of Helsinki in Kumpula district of the Finnish capital city. 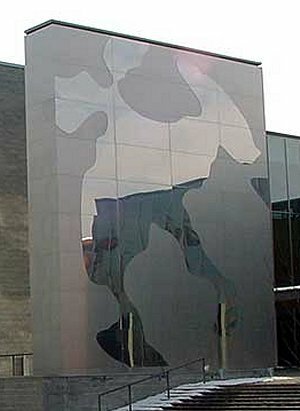 The sculpture is called Light and matter and was made by the sculptor Antero Toikka in 2001 It shows the image of the universe through a depiction of ground steel, which reflects the surroundings. The picture is the image that appeared at the first identification of the universe by IRAS satellite (Infrared Astronomical Satellite) in 1983. It is not the whole picture of the universe it delineate but rather the part, that is possible to observe from our earthly point in universe. As shown in the photograph of the statue, this part would consist of an irregular central area, from where arms are emanated. It would be similar to an amoeba or a spilled liquid. It is likely that this is a more realistic picture of the universe than an American football. But in terms of philosophy of life, this picture seem daunting and does not provide a sense of control. Because Americans are religious believers and more or less superstitious NASA chose to schematize and generalize the image to a safer oval. But the picture of the statue in Kumpula also seems to support the American Russian cosmologist Andrei Linde's controversial hypotheses that there would be many universes, perhaps not less than 101 000 pieces (see article on Linde in FoF No 4/2007: http://fof.se / Journal / 2007/4 / he-is-supposed-longest). Among other things, new universes arise through spin-off of from the elderly. Can not picture the statue Kumpula read as several spin-offs from our universe is about to happen? Could not then the so-called dark energy, which makes up about 73 percent of the energy of the universe, be designed to also drive this process? But more important was that the latter COBE- and WMAP satellites confirmed the growing suspicion that the universe is flat. It would have a height or thickness of a few hundred thousand light years. The confirmation of flatness was sensational, because at this point it turned out that Einstein had been wrong. According to him, two parallel lines eventually meet. But in a flat universe they do not. The new image of the flat universe also showed that the Big Bang was not an explosion, which extended in all directions, but an inflation, which expanded horizontally. Inflationary theory was presented by the American Alan Guth in 1981 and that his calculations showed that the horizontal extension happened at a tremendous speed — hundreds of times faster than the speed of light. The rapid but very short inflationary phase did that our future solar system ended up so far from the big bang point that today we can look back in time and thus can determine that the Big Bang occurred about 13.7 billion years ago. Observations of nova explosions of a certain common type, which was made by a team led by Nobel Prize winner Saul Perlmutter in 1988, showed that the universe is still expanding and with an increasing pace. But that is an expansion that continues to be horizontal. It raises the question of what prevents a vertical expansion of the universe? Maybe the flatness of the universe is explained according to the mechanistic physics that a vacuum pressure is exerted by the surrounding cosmos. Another possibility is the Higgs field, which provides energy particles mass, can not expand vertically. A third possibility is that the universe is bounded above and below, its horizons, with a layer of dark matter. A fourth possibility is that the vertical expansion is prevented by a bran according to string theory. The bran is the abbreviation of the word membrane. The multi-dimensional, in different ways, constantly vibrating strings of energy would be trapped in the bran. In the English Wikipedia of 11.20.2013, under the entry word ”String Theory”, is stated: ”Branes are dynamical objects which can propagate through spacetime according to the rules of quantum mechanics”. They can, according to the same source have both mass and charge. Perhaps it is the case that a two-dimensional branes spread out above and below our universe and prevents vertical expansion. It is the latter possibility that we first will discuss. Let's start with the American physicist Leonard Susskind. He is a professor of theoretical physics at Stanford University in California. He is also one of the leading string teoretician. He starts from the discussion of the black holes, which resulted in the realization that at the point, where the abyss of the black hole begins, at its horizon, information about any object pulled down the hole is preserved. From an information theoretical point of view, he wanted to regard the baryon world, ie the world of atoms, as a form of three-dimensional hologram created and steered by gravity. What guided him was the principle of duality. The most common example of duality is the fact that a particle of light, a photon, can be described both as a particle and a wave. What physicists do not realize is that all forms of organic life also has a similar duality: We are as well our body and brain, the phenotype, and the genetic set, the genome or genotype. Both developes, the former during a relatively short time, the latter during much longer time. Another duality may exist between the edge of an area and the latter's content. Michael Smedbäck exemplifies in the above article with a chess board and its edge. When the pieces are placed before a game at the opposite edges, the surface is limiting the number of chess pieces. If the inner of the universe consists of holographic devices, controlled by gravity, would edges according to the principle of duality be without gravity. The edge could then be a two-dimensional surface where the holographic content of the universe would be inscribed. Then there is the step that would say, that the ”text” on the two-dimensional edge would through gravity control the three-dimensional holograms, may be the same way the genotype controls the phenotype in humans. But is this not Platonism? The Greek philosopher Plato (427-347 BC) put forward the idea of a dualism between the world of ideas, which stands outside of time, and the world of matter, which is the shadow of the world of ideas and driven by time. The two-dimensional margin of the edge of the universe seems to have – with Wittgenstein's term – a family resemblance with the Platonic ideas as well as the idea that the world of atoms is the hologram has one with Plato's view of the material world as the shadow image. I do not think these family recemblances are coincidences. Old knowledge tend to (often unconsciously) bubble up in modern science (eg in the terms dark matter and dark energy, as involuntarily taking after a very old notion that black is a symbol of invisibility). The aforementioned Dutch physicist Gerard 't Hooft want to replace string theories with something radically different. In the article mentioned above, he suggested that our universe should be understood quantum mechanically as ”a cellular automaton”. It could be translated roughly as a cell-like self-contained unit on quantum physical level. Although he does not seem to say that the universe as ”automaton” would be autonomous the possibility is in the air. However, he adds that the ”automaton” would evolve deterministically. Maybe it means that when the Bing Bang occurred, everything that followed was predetermined by the event, which does not exclude a certain degree of feedback, thus self ruling. Maybe the Dutch physicist imagine that a feedback occurs through the entangled particles, because these have been shown to possess a memory capacity, which was discovered early by quantum physicists. But it is a paradoxical but very simple memory: Two particles that interacte both remember what happened, a memory that seems to work at great distances (some speak of a ”telepathic memory”). Both remember the rotation, called the spin, of the second particle. If the spin of one changes, it changes also in the other. During the Big Bang inflationary phase quantum energy is spread in very, very high temperatures horizontally across a really huge area. But when the momentum began to wane, the temperature also dropped. Somewhere during this stage of the slowdown came Higgs field in the function. Some energy strings got mass and became particles, which immediately began to merge with similar particles thanks to the powers that the Higgs field also freed. Thus began to form different kinds of matter. While quantum energy, as far as we know, has remained largely the same, the world of matter has evolved dramatically: structures appear to have been organized out in the form of solar systems and galaxies and in the solar fusion furnaces have heavier atoms originated. In what appears to be the next step rocky planets have been formed in new solar systems and on planets the chemical evolution has developed also in the form of organic life. Quantum energy is undeniably exciting in its mystery, but the world of matter is in a remarkable way creative. The latter has led many as the Catholic Church, who finally learned their lesson during the Enlightenment, to see the Big Bang as the Creation itself. But this is probably wrong, because quantum energy was already there. More meaningful is to regard the Big Bang as a kind of phase, thus similar to the change to ice water undergoes when the temperature drops below zero. At the Big Bang it seems as the Higgs field was activated, which made it possible for the quantum energy to turn into matter. Quantum energy would be the very condition for the universe's existence but it is its phase shift to matter, that has enabled the development of the universe. Quantum energy and material world are linked and would together form the ”automaton” that Gerard 't Hoft is talking about. Then it is justified to suspect that the feedback and the memory function would be in the more developed part, the world of matter. However, it has been shown to consist of two kinds of matter: light and dark one. The existence of dark matter was proposed in the early 1930s by the Dutch astronomer Jan Oort (1900-92) and his Swiss colleague Fritz Zwicky (1898-1974) as an explanation for that the Milky Way and other galaxies are not scattered, which they should with their high speed relative to their visible mass. Dark matter does not interact with electromagnetic radiation, ie light, and therefore remains invisible. However it appears to interact with gravity. The explanation to the fact, that we are not able to observe dark matter otherwise than indirectly has to do with our perception organs evolved as an adaptation to the four-dimensional reality. We have to try to learn to think in new ways. This also occurred in 2006 and 2008, when astronomers joined the different techniques of Chandra- and Hubbletelescopes and managed to take pictures that showed both times how a galaxy is surrounded by dark matter. Galaxy cluster MACS J0025.4-1222. The photo is a combination of two images, one taken through a gravitational lens of the Hubble telescope and the other by an X-ray camera in the Chandra telescope in 2008. The pink tile in the picture shows the bright matter distribution in galaxies, the blue of the surrounding dark matter. Photo from Wikipedia. The galaxies are surrounded by a halo of dark matter, which increases the mass of galaxies and thus their gravity. However, this halo can have another function besides the interaction with gravity. One possibility is that the halo helps to organize the galaxy. In addition one could imagine that it is responsible for the recording and remembering of what happens in the bright part of the galaxy. However, if galaxies are surrounded by dark matter, is it not probable, that a similar halo surrounds black holes? This could be the explanation for the mathematically proved hypothesis, that its horizon of light remembers everything that falls into the hole. Light matter have a memory capacity which, however, is limited to certain conditions, as we can see by the fossils found in old mountains. The dark matter does not appear to have this limitation if it is the one who remembers everything that disappears down the hole. So it is likely that also black holes have a halo of dark matter with more developed memory capacity than the bright matter. If galaxies and black holes have a halo of dark matter, it could also be that the universe has a layer of dark matter at top and bottom. It would then also register and remember a lot of what happens in the universe. This rather extensive memory capacity would then somehow be exploited by the universe for feedback and self ruling. 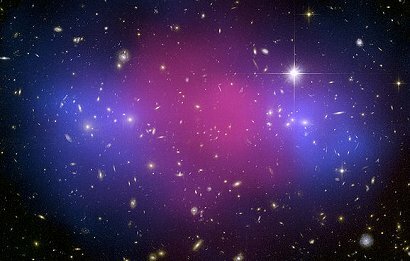 Dark matter is not more widely discussed by string theorists and quantum physicists. But it is not less than 84.5 percent of all matter in the Universe. It must have some role alongside interaction with gravity. But after Gerard 't Hoft suggestions about the universe as a quantum mechanical ”automaton”, it might be proven that the dark matter acts as the memory that the universe must have to be self ruling. If this speculation turns out to be reasonably accurate, the universe would not, in philosophical terms, be a daunting inhumane and ”soulless” machine, but something more developed. The aforementioned Andrei Linde has been an avid spokesperson for the anthropic principle, ie, that the universe is designed to develope life. In light of the above speculation, it would also more resemble life as we know it on earth, than something lifeless. But we need not go so far as to believe that it has a consciousness. In line with the anthropic principle, it would perhaps steer itself towards some sort of fertility in the form of ligations of new universes with opportunities for new life to emerge. Please, send a comment to the essay!